Triple piercings for the lovely Steph… anti-tragus w/1.2mm x 10mm curved titanium bar on the right ear, whilst double helix piercings w/1.2mm x 10mm titanium bars on the left ear. Pleasure to meet so many sweet people this Summer. 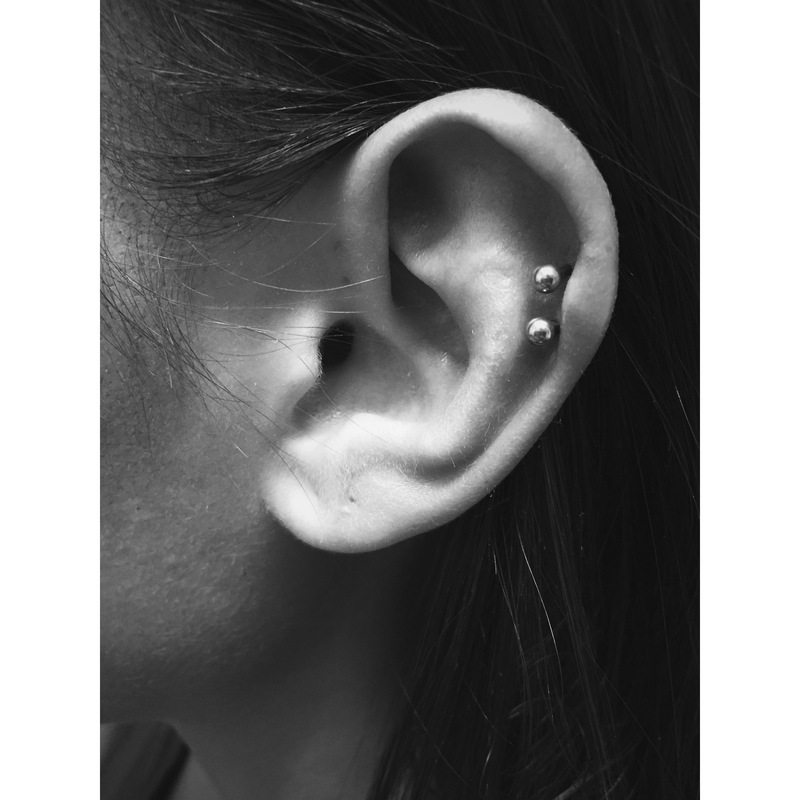 This entry was posted in Anti-Tragus Piercing, Piercing Portfolio, Top Ear / Rim Cartilage Piercings and tagged Anti-Tragus Piercings, Body Mods, Body Piercer, Double Helix Piercings, Double Top Ear Piercings, El Capitan, Greenwich, London, Piercing Portfolio, SE10, Shiva Piercings, Titanium, Top Ear / Rim Cartilage Piercings, Triple Pierced, Triple Piercings. Bookmark the permalink. Double piercings for the lovely Rachel, a snug drift on the right ear and the anti-tragus on the left; both w/1.2mm curved titanium bars. 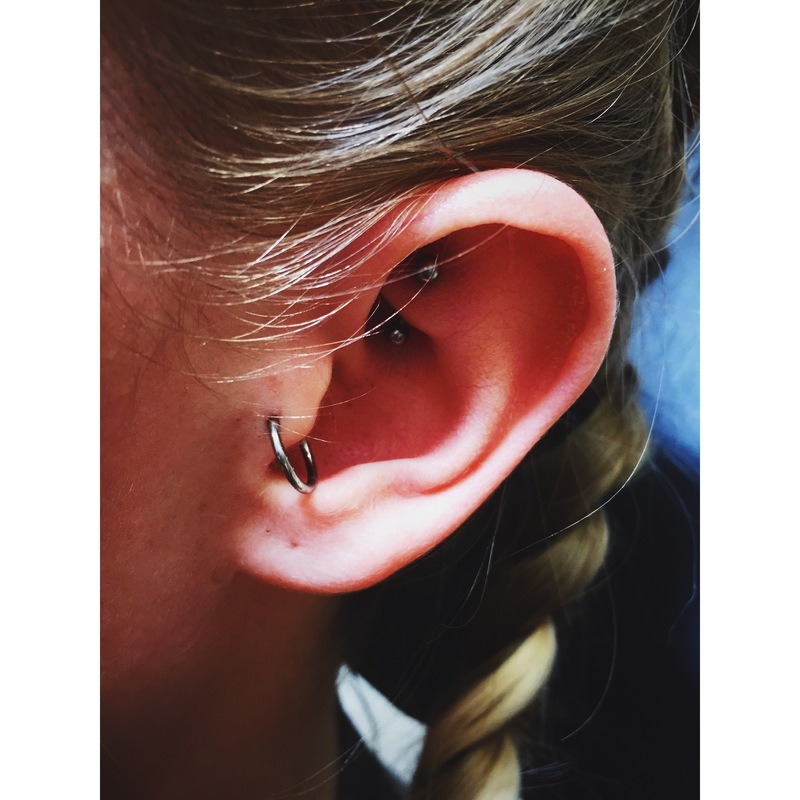 This entry was posted in Anti-Tragus Piercing, Piercing Portfolio, Snug Piercings and tagged Anti-Tragus Piercings, Body Mods, Body Piercer, Double Piercings, El Capitan, Greenwich, London, Piercing Portfolio, SE10, Shiva Piercings, Snug Piercings, Titanium. Bookmark the permalink. 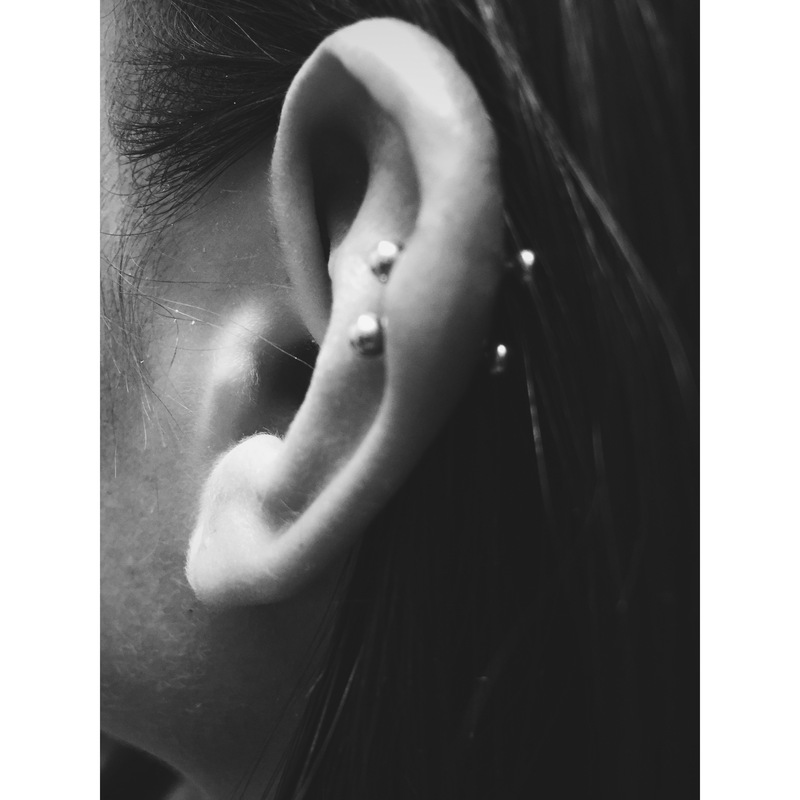 Kelly @ instagram.com/pinholepiercings left ear, most of the work done here by myself. 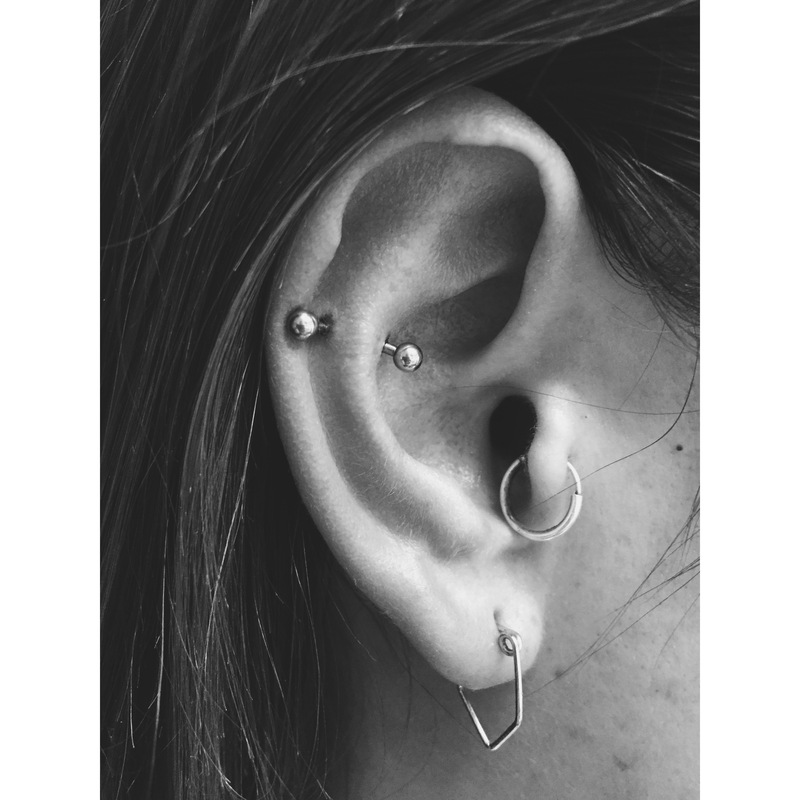 I thiiink the anti-tragus, conch, top ear possibly and the lower two, lower cartilage and the middle one closest to the lobe were all pierced by me. 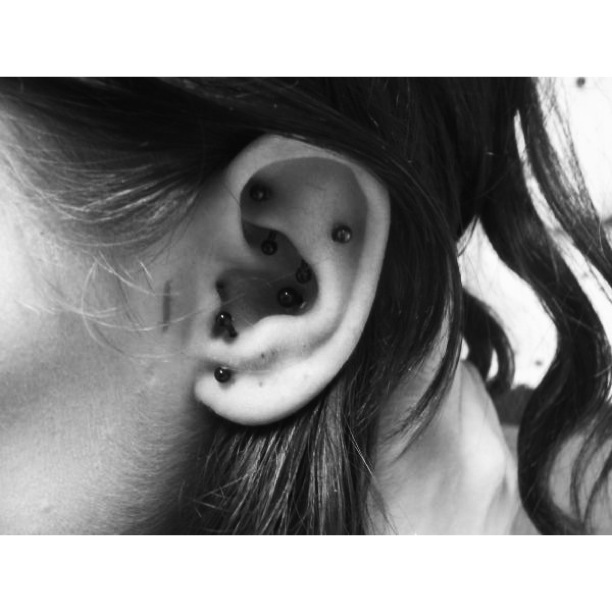 The middle one of the lowest three, a lobe drift I guess; was the very first piercing in the new Shiva piercing studio. 330-332 Creek Road, Greenwich, London, SE10 9SW. Our grand opening was on Sunday, January 26th. It was fitting for the first piercing to be an addition to Kelly’s collection, Miss pierces @ Shiva on Tuesdays & Wednesdays, 10-6. 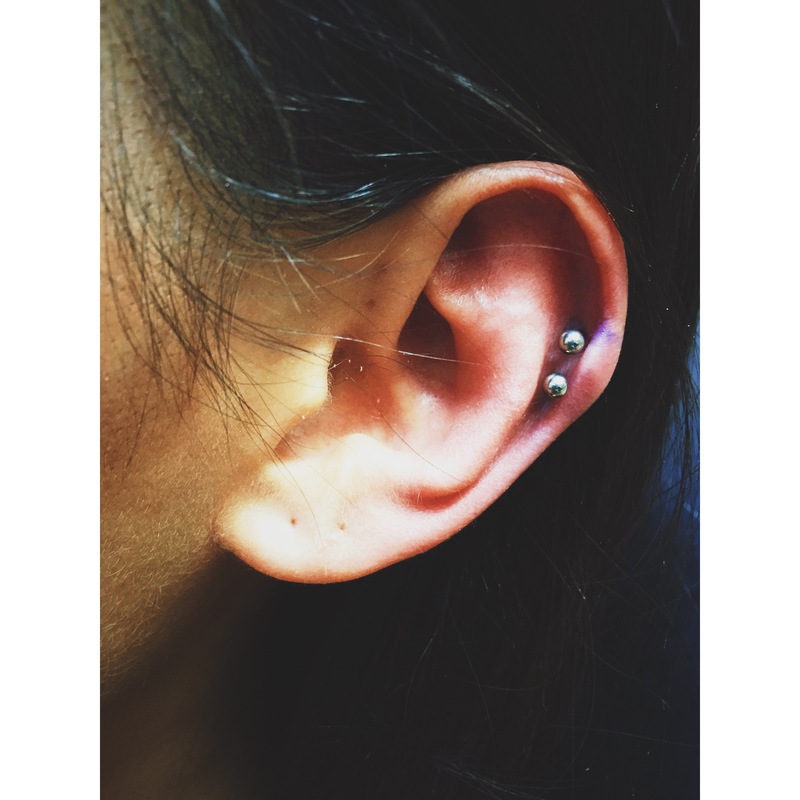 This entry was posted in Anti-Tragus Piercing, Conch Piercing, Lobe Piercings, Lower Cartilage Piercings, Piercing Portfolio, Top Ear / Rim Cartilage Piercings and tagged Anti-Tragus Piercings, Conch Piercings, El Capitan, First New Studio, Greenwich, Lobe Drift Piercing, Lobe Piercings, London, Lower Cartilage Piercings, Piercer 2 Piercer, Piercing Portfolio, SE10, Shiva, Shiva Piercings, Top Ear / Rim Cartilage Piercings. Bookmark the permalink. Here’s an anti-tragus piercing w/1.2mm x 10mm titanium curved bar; also fitted the colourful CBB in the top ear. 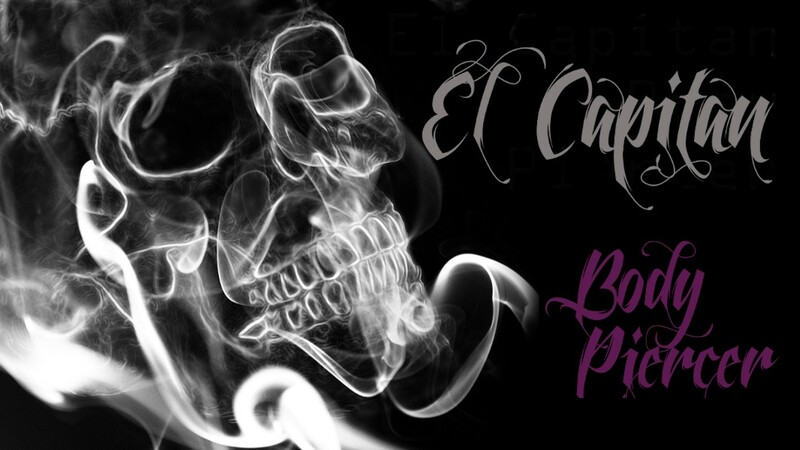 This entry was posted in Anti-Tragus Piercing, Piercing Portfolio and tagged Anti-Tragus Piercings, El Capitan, Greenwich, London, Piercing Portfolio, SE10, Shiva Piercings. Bookmark the permalink. 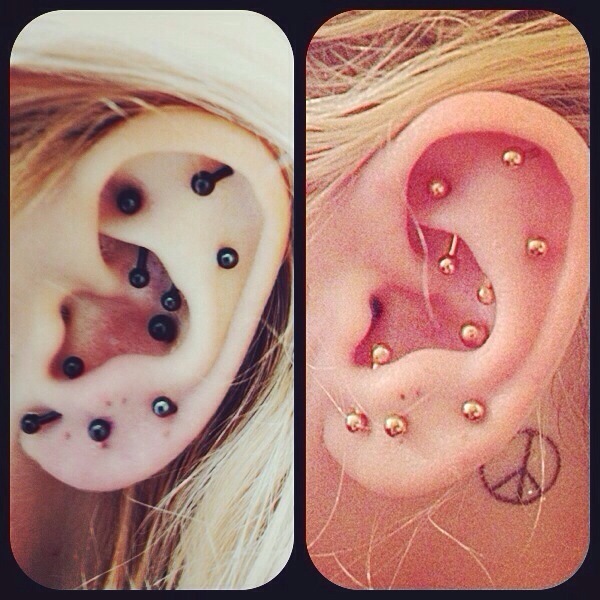 Here is a collection of piercings from a repeat customer, Dean; although not all of them pierced by me. 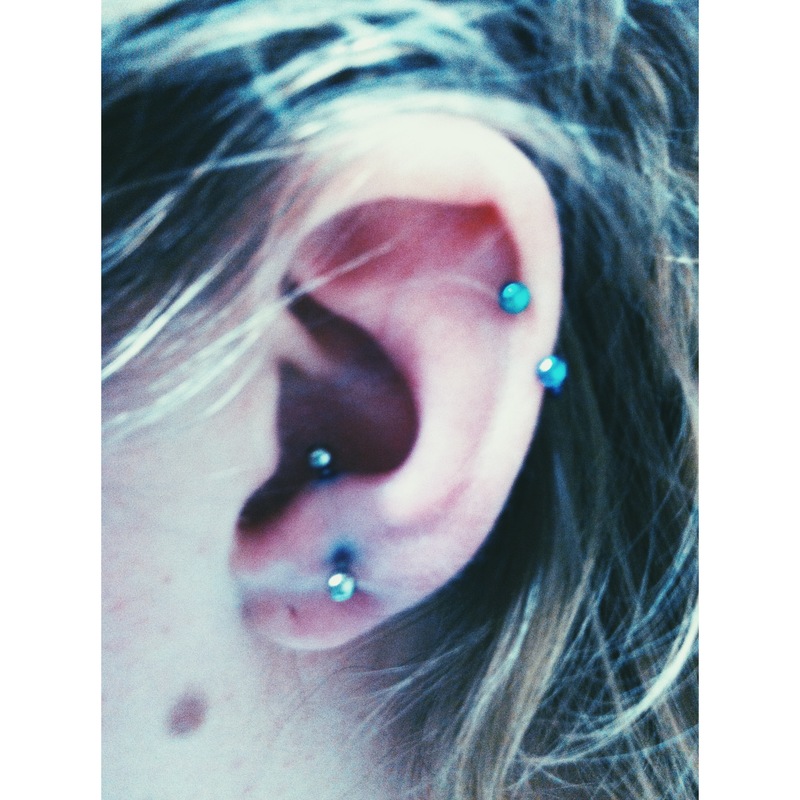 My work here is the Anti-Tragus, Snug and Top-Ear/Rim Cartilage. Returning clientele is always a good sign for bidniz. All the piercings here are with 1.2mm jewelery. 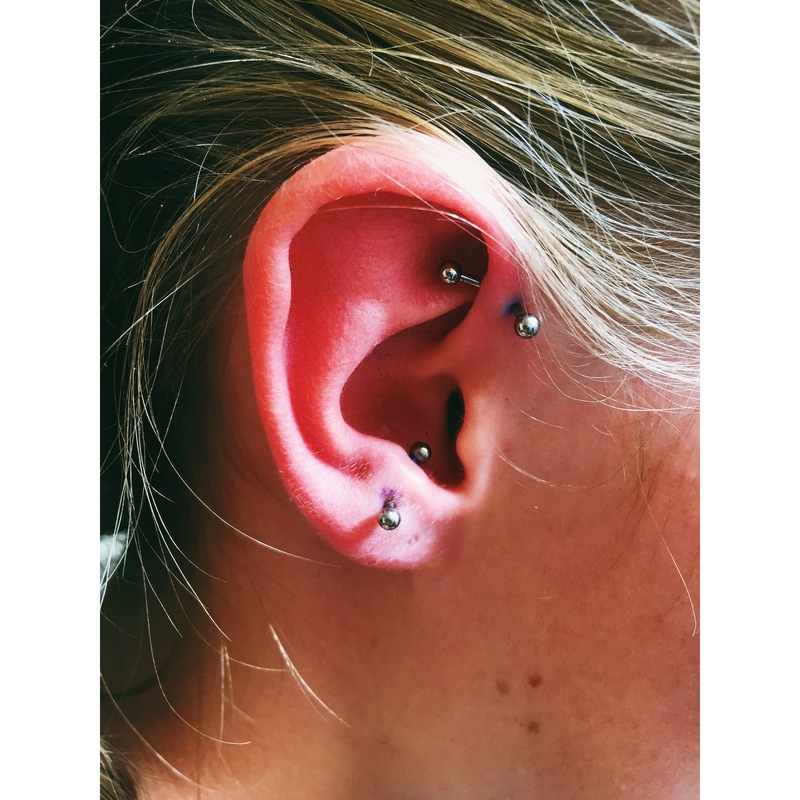 This entry was posted in Anti-Tragus Piercing, Piercing Portfolio, Snug Piercings, Top Ear / Rim Cartilage Piercings and tagged Anti-Tragus Piercings, Piercing Portfolio, Returning Custom, Snug Piercings, Top Ear / Rim Cartilage Piercings. Bookmark the permalink.